Don’t miss my stand-up tragedy Boneyards while it’s in NYC at the Morbid Anatomy Museum. Last chance to book now. Later this month Jeffrey Stanley discusses seance as performance art in the Washington Post. Stay tuned. Philadelphia, PA – The ongoing seance-as-theatre experiment continues. After a successful run in the 2013 Philly Fringe BONEYARDS is back from the dead to rock your underworld just in time for Halloween. Same autobiographical, spooky show, same mouldering location, same real ghosts. 4 dates: 10/17, 10/20, 11/2 and 11/3. Tickets $10, seating is limited to 20. The hilarious, eloquent and haunting follow-up to Stanley’s 2011 hit “Beautiful Zion: A Book of the Dead,” this true to life romp resurrects the cadaverous–from Philly’s Laurel Hill Cemetery to a British colonial graveyard in India to ancient Greek tomb worshippers. Paranormal activity guaranteed. Times, tickets, photos, press, playbill, and real voices from the dead here. BONEYARDS is back from the dead to rock your underworld just in time for Halloween. 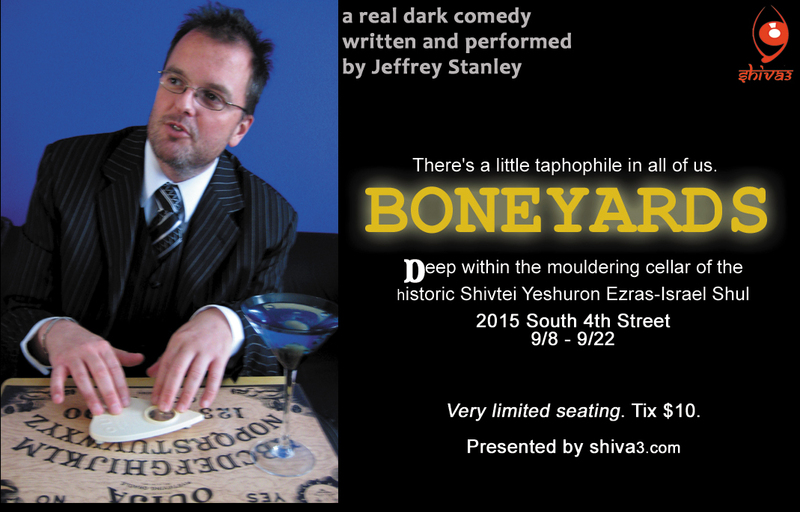 Shiva3 is proud to announce the return of Jeffrey Stanley’s solo show BONEYARDS which was a hit in the 2013 Philly Fringe. The 80-minute show will again be performed in the dark, dank coal cellar of the century-old storefront Shivtei Yeshuron Ezras-Israel Synagogue, also known as “the little shul” (part of the June 2013 Hidden City Festival) at 2015 South 4th Street in South Philly near Snyder Avenue for 4 performances. Stanley’s solo show is a followup to his 2011 Fringe hit BEAUTIFUL ZION: A BOOK OF THE DEAD. Stanley is also a dramatic writing faculty at New York University Tisch School of the Arts and at Drexel University Westphal College of Media Arts & Design. He is a religion blogger for the Washington Post. Boneyards 9/17 show SOLD OUT. Only 1 show left. The Tuesday 9/17 8pm show has sold out, waiting list, unfortunately turning people away at the door. We crammed in as many as would safely fit. Only 1 show left–this Sunday 9/22 at 2pm. We hope to see you there. $10 tix here. Boneyards 9/15 show is SOLD OUT. Only 2 shows left. The Sunday 9/15 2pm show is sold out. Only 2 shows left–this Tuesday 9/17 at 8pm and next Sunday 9/22 at 2pm. We hope to see you there. $10 tix here.